FlexyCUBE allows operation of multiple parallel reactor units using SYSTAG’s control software. 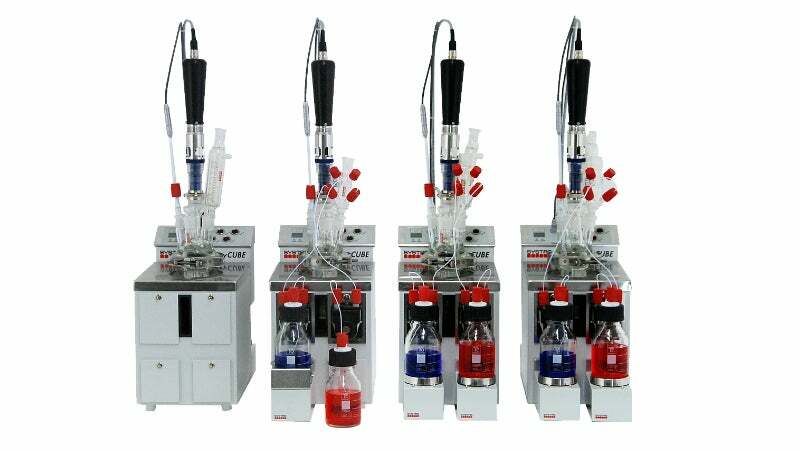 It comes with tools and functions, which enable the simulation of complex processes, such as hydrogenation, Grignard or Friedel-Crafts reactions, nitration and esterification, and acetylation. This automation tool provides can process multiple experiments reliably and in a short time. It offers a wide range of applications, with projects controlled individually or in parallel, for example for Design of Experiment (DoE) projects. Reactors are easily detached from the heating and cooling system and exchanged. The two-part reactor approach with hermetically separated temperature jacket eliminates emptying and filling of the temperature control system and messy dripping of the heating or cooling medium. The FlexyCUBE has a high-reproducibility and productivity, ideally suited for design or experiments (DoE).